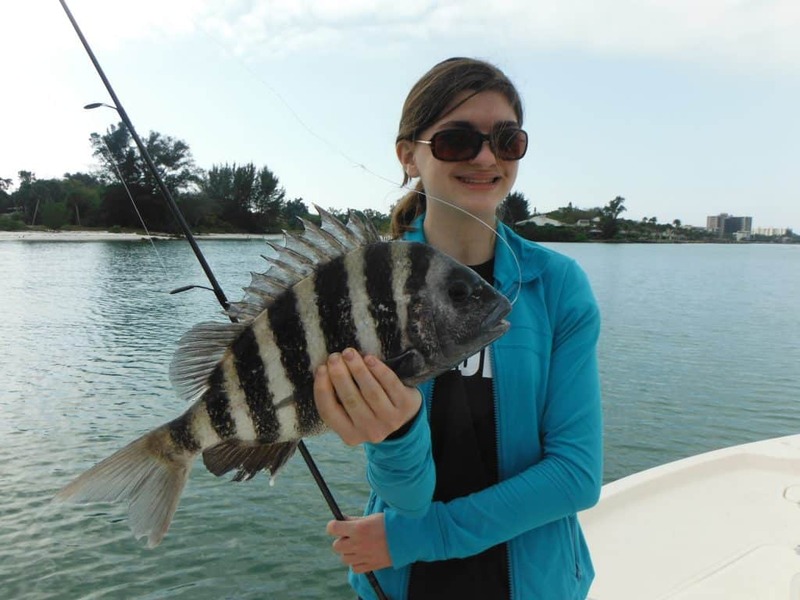 Sarasota sheepshead fishing is fun for all anglers. They are a great fish for anglers of all ages and experience levels. They are widely distributed along the Gulf Coast and up the East Coast to New York. Sheepshead put up a great battle and are fine table fair. Sheepshead are a member of the porgy family. They arrive in the Sarasota area around Christmas and stay until early April. The sheepshead run peaks in February and March. Sheepshead are bottom feeders and are taken almost exclusively by anglers using live, fresh dead, or frozen bait. 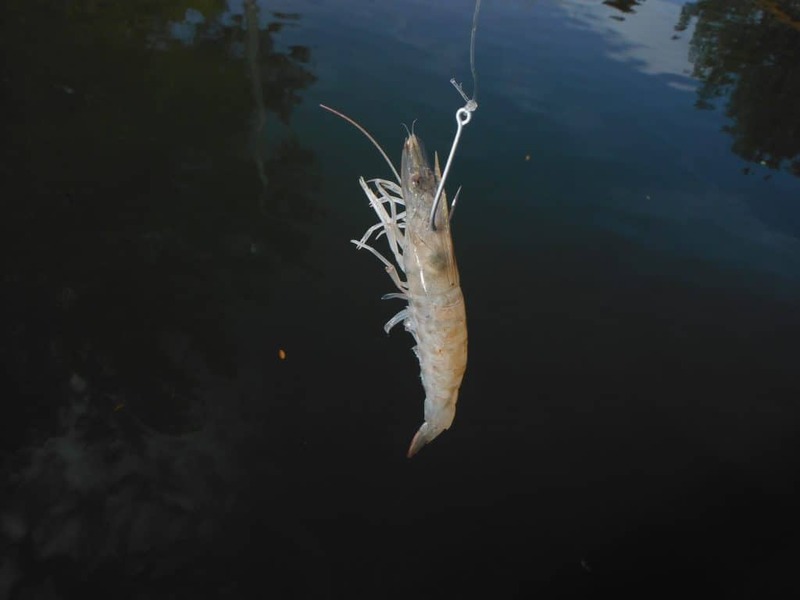 Live shrimp are the most popular bait. They spawn around structure such as submerged rocks, docks, bridges, and oyster bars. Many of my northern clients confuse our Sheepshead with their “sheephead”. It is an entirely different species. The northern sheephead is considered a trash fish with no real food value. Our Sheepshead, while difficult to clean, is fantastic eating. Sheepshead also put up a great fight, using their wide bodies to pull hard against the bent rod. Imagine a bluegill on steroids and you have a sheepshead. Most anglers targeting sheepshead using spinning tackle. Conventional tackle can be used, especially when fishing vertically. Many anglers fishing in the Gulf of Mexico prefer conventional tackle. Spinning tackle is certainly more popular for inshore anglers. It allows them to present baits both vertically and also to cast the bait towards some likely structure. A 7 foot spinning rod with either 12 pound monofilament or 20 pound braided line is ideal. A 30 inch piece of 30 pounds fluorocarbon leader is tied onto the running line. Anglers can attach the leader using a line to line not such as the double Uni-knot or a number 10 black swivel. A #1 live bait hook or #3/0 circle hook completes the rig. Anglers fishing the Gulf of Mexico are required by law to use circle hooks. The reason for this is than invariably other reef fish such as grouper and snapper will be caught. Circle hooks allow for a healthy release. Sliding egg sinkers are used to keep the bait on the bottom. The general rule of thumb is to use the lightest sinker possible to get down and hold the bottom. The sinker can be slid onto the running line ahead of a swivel. Then the leader is attached to the other end of the swivel. The leader can be attached without a swivel. The sinker is then allowed to ride on the eye of the hook. This is what we term a “knocker rig”. Both allow the sheepshead to pick the bait up and move off without feeling the resistance of the weight. Sheepshead will almost always be found near some type of structure. Here in Sarasota, we began our sheepshead hunt near the passes. Both big Sarasota pass and New Pass have deep water, good current flow, and plenty of structure. 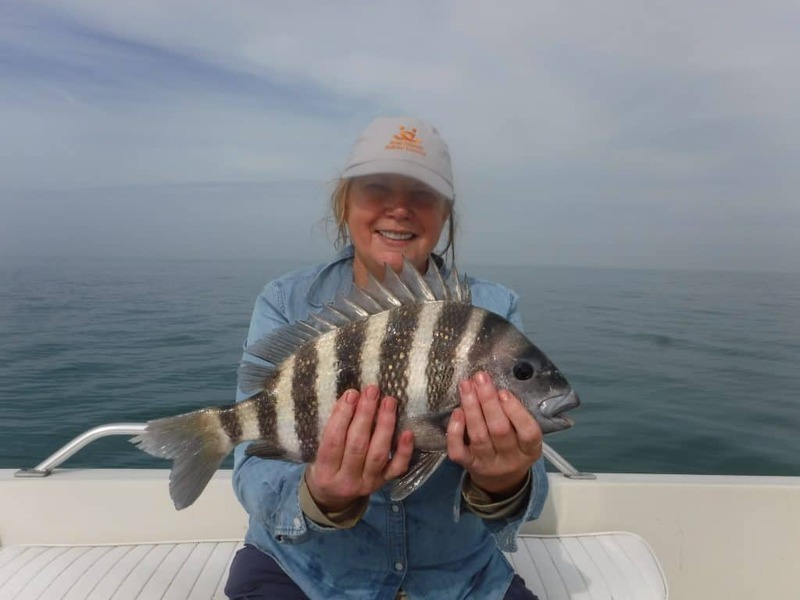 This makes for ideal sheepshead habitat for anglers Sarasota bottom fishing. The best time to fish the passes is during times of slower moderate current flow. It is just too difficult to fish when the tide is running hard. Anchoring is difficult and a lot of weight is required to keep the shrimp on the bottom. During these times of high current flow, docks and 6 to 10 feet of water that are near the passes can be very productive spots. Anglers fishing the passes can choose to either anchor or drift. Both have their advantages and disadvantages. Drifting is a great approach when tides are slack. It allows anglers to cover some water without drifting to quickly over the fish. Snags are more of an issue from a drifting boat on a Sarasota fishing charter. I anchor most of the time when sheepshead fishing. The boat stays exactly where I wanted to, and once the bite gets going the fishing can be fast and furious. Structure in 8 to 20 feet of water hold most of the sheepshead. Other species such as gag grouper, mangrove snapper, gray snapper, pompano, and flounder will also be taken. Sheepshead are notorious for their ability to take bait off a hook without being caught. They are world class bait thieves! One mistake many anglers make when sheepshead fishing is trying to “set the hook” when a bite is felt. This really applies to all fishing with live or cut bait. Here is the technique that I teach my clients when sheepshead fishing on my charters. When sheepshead take a bait, anglers will usually feel a “tap” or series of “taps”. It is crucial that the bait be kept perfectly still while this occurs. Eventually, the angler will feel a steady pull while the rod tip bends. The angler should reel quickly, taking up the slack, then slowly raise the rod tip. This will result in a much higher hook-up ratio. If the fish is missed (which will happen many times) the hook is re-baited and cast back out. Sarasota is fairly developed. This means a myriad of residential canals, all of which have plenty of docks. Docks are great places to target sheepshead from December through March. As previously mentioned, docks in 6 to 10 feet of water with a little current flow are perfect. The best technique is to anchor a cast away up current of the dock. Anglers then pitched baited hooks towards the pilings. Often times we are faced with windy conditions during this time of year. Docks and canals along Siesta Key and Lido Key offer protection from the wind, giving anglers on Sarasota fishing charters the chance to enjoy a productive day when they may perhaps be forced to stay home otherwise. Black drum, redfish, flounder, snook, and other species will take a shrimp meant for sheepshead. Oyster bars can be an overlooked sheepshead hot spot. The best bars are those that are just covered up on high tide and drop off into four or 5 feet of water. Sheepshead will cruise the edges of the bars in search of oyster crabs and other crustaceans. A hook with just a light split shot will get the job done. There are several artificial reefs just off the Lido Key beaches. These reefs consist of concrete rubble and the remains of bridges and other structure. They lie in 30 feet of water to miles offshore. When the seas are calm, they can be terrific spots to target sheepshead. I will often times catch my largest fish of the year in these locations. All three inshore reefs hold fish, but all are different. The Roehr Reef is the smallest and the closest to shore. It holds sheepshead as well as other bottom fish. Only three or four boat can fish it at once. The Fisher Reef has some very good structure and is a bit further out, right off of New Pass. Several boats can fish there at once. The Silvertooth Reef has a ton of structure scattered out over a large area. It is very good for sheepshead along with bottom fish and mackerel. Natural ledges in the same areas will also hold sheepshead along with mangrove snapper and gag grouper. These ledges are small and difficult to locate, but once found can be highly productive. Most anglers don’t take the time to find a spots, so they get less fishing pressure than do the artificial reefs.The best way to locate these ledges is to key a sharp eye on the bottom machine while trolling. Most anglers do some trolling for king mackerel or Spanish mackerel at one time or another. This is a great way to find good bottom fishing spots. The Rocky structure at the north end of Siesta Key is a fantastic Sheepshead spot in the winter and early spring. Deep water, plenty of structure, and good current flow attract and hold the fish. 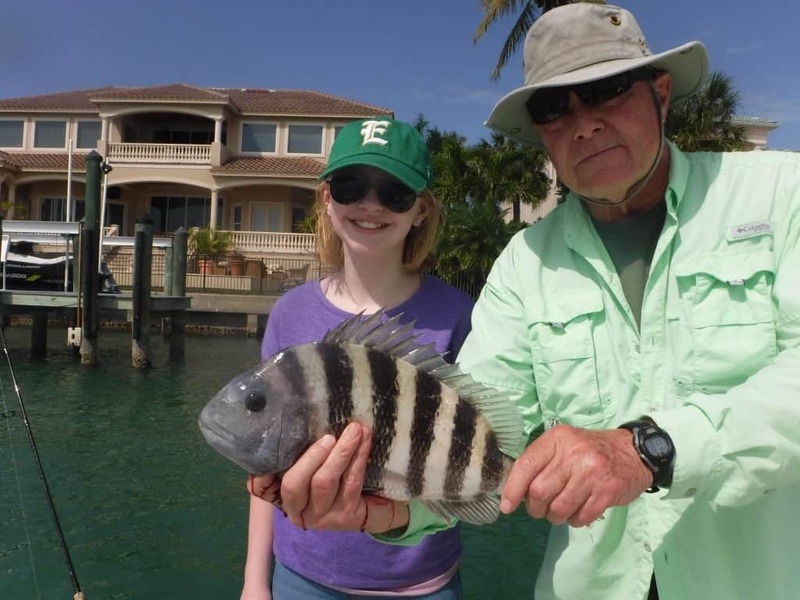 Docks along bird key in the northeast part of Siesta Key are proven Sheepshead spots. They are a great option when title flow and the passes is too strong. Also, no matter how stiff the breeze, there is usually a protected side to fish. Docks and rocks and New Pass are productive as well. New Pass is also a bit more protected from the weather. The new pass bridge is a fish magnet, holding sheepshead and just about every other bottom fish species. Bait is easily obtained at the New Pass bait shop near the bridge. The Ringling Bridge pilings hold plenty of sheepshead as well. The bridges and 10 to 12 feet of water and has plenty of structure for sheepshead and snapper. Drifting near the pilings with the bait as close as possible is a great technique. The New Pass Bridge, Siesta Drive Bridge, and Stickney Point Bridge all hold fish as well. Docks in Roberts Bay south of the Siesta Drive bridge hold plenty of sheepshead and black drum. They are great spots to fish when it is blowing hard, offering protection from the open Bay. The channel edges in the no wake zone in the Intracoastal Waterway between the mouth of Phillippi Creek and the Stickney Point Bridge are another good spots of fish on breezy days. 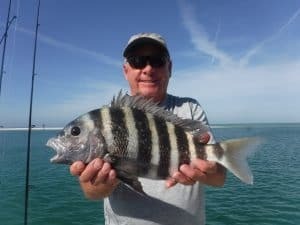 Artificial reefs off of the Lido Key beaches are easy accessed on a nice day and hold a lot of sheepshead in the cooler months. Anglers can get a list of the reefs and coordinates HERE.